If you are following a forum page, you need to manually press the refresh button to view latest changes on that webpage. Same is true to check new emails in inbox – are you tired of this routine? Well, you can make any webpage refresh automatically after specific period of time in Firefox browser using ‘Reload Every’ plugin. 1. 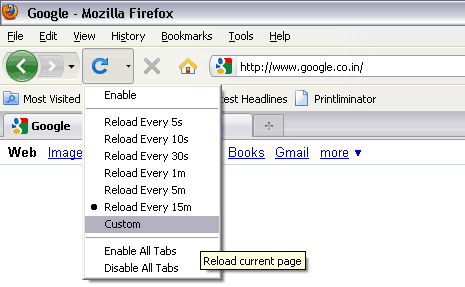 Open Firefox browser & download Reload Every plugin. 2. Install the plugin and Restart Firefox web browser. 3. Open webpage & click ‘arrow’ next to Refresh icon to select Reload time. 4. Click on Custom option to enter specific time (in minutes, seconds) for refreshing. For sure a time saver to stay updated with dynamic webpage content with auto refresh and reloading, what say?